The Ford 108 Comfort Assembly is a quality replacement seat assembly for your Ford-New Holland tractor. Seat frame is steel. Seat and backrest have steel cores. Backrest has a 2" foam cushion and seat has a 4" foam cushion. Cushions are replaceable separately. 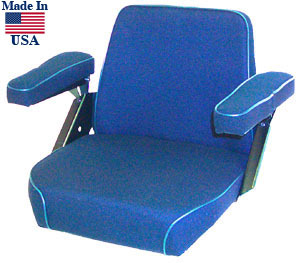 Armrests fold up and adjust for height. Assembly is also available without armrests. Available in vinyl or fabric.